(The name of our Core Values Goat Mascot) - Each letter of his name represents a core value. 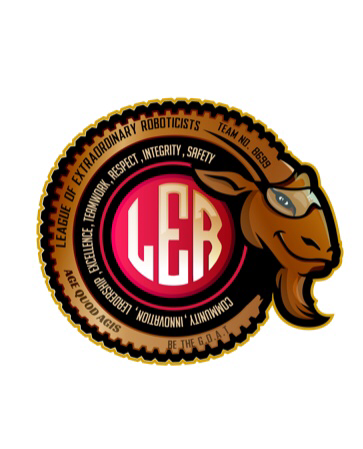 SAFETY FIRST - Everywhere, All the time-In-line with LER's mission statement, SAFETY is more then wearing safety goggles and using equipment safely, it is about being safe all the time, not just in Robotics. 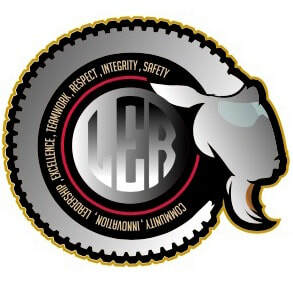 LER’s Safety plan is the foundation of our core values. It includes having a safe environment, free of incidents, accidents, unsafe actions, inappropriate words, whether in person or on-line. It also involves being aware of our surroundings for ourselves and others. Knowing that if we see something that may be unsafe, we have an obligation to say something and when we do, we won't be judged! INTEGRITY - Do What is Right All the Time Even When No One is Looking - We understand the importance of keeping our word and practicing our core values not just stating them. RESPECT - Self, Others and Property - Respect is more than treating others as you would like them to treat you. It requires self-respect and respect for people, places and things… By liking yourself enough to be yourself, by accepting others for who they are, by valuing diversity and inclusion and by showing kindness to everyone. TEAMWORK - Working together we can accomplish more! Teamwork includes collaboration and partnerships with individuals and organizations outside of our immediate team, to work together to accomplish common goals! EXCELLENCE - Whatever you do in life strive to be the G.O.A.T - The Greatest Of All Time - We will always strive to do our best to Exceed Expectations and “Do Well in Whatever We Do…” and we will continue to improve by learning from our successes and failures. LEADERSHIP - True leaders don't create followers they create more leaders - “If your actions inspire others to dream more, learn more, do more and become more, you are a leader.” We will continue to work to rise above challenges and work through adversity and inspire others to do the same! INNOVATION - Imagine What is Possible and Work Hard to Achieve that Goal - We will constantly look for creative ways to solve problems and find innovative solutions. We believe in giving back to the community through charitable contributions of our time, resources, expertise, and by encouraging volunteerism and active participation.